Aglime is the cornerstone of a good soil fertility program. Aglime and fertilizer work together to build soil productivity – you increase profits because you get higher yields of better quality crops. Despite the importance of aglime, only 15 percent of Wisconsin cropland that needs aglime actually receives it in any given year. It creates a favorable environment for microorganisms to efficiently break down organic residue. It increases nitrogen fixation by bacteria. It improves the availability of certain essential plant nutrients – primarily molybdenum, nitrogen, phosphorus, potassium, and sulfur (figure 1). It reduces manganese and aluminum toxicity. It improves the performance of triazine herbicides. It adds calcium and magnesium, two essential plant nutrients. The benefits of aglime include higher quality crops. 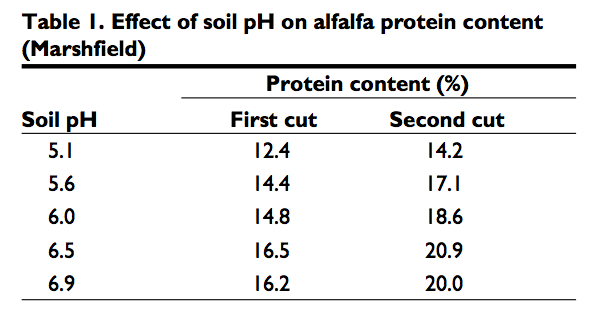 For example, liming improves alfalfa quality by increasing alfalfa protein (table 1). 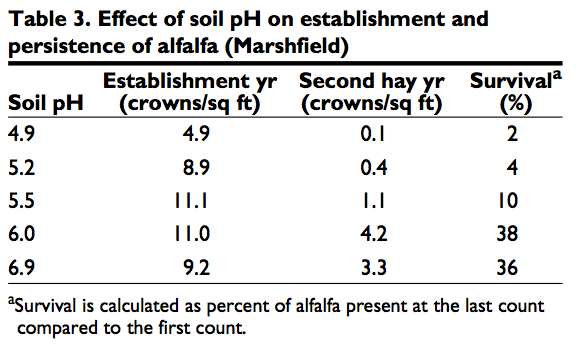 Research at the Marshfield Experimental Farm indicates that alfalfa hay yields can be increased more than 0.125 ton per acre for each 0.1 unit increase in soil pH. 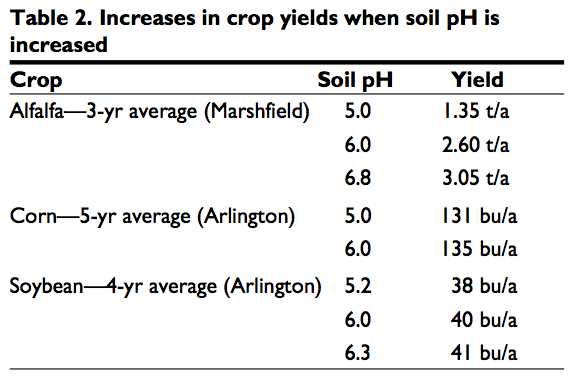 Other crops also show yield increases when aglime is added to increase soil pH (table 2). If you use the recommended amount of aglime and fertilizer, you’ll get more alfalfa established and your alfalfa will withstand those cold Wisconsin winters better (table 3). While liming will not eliminate diseases, it may decrease the amount of damage they do. Some research shows a strong relationship between liming and reduced disease severity. A Wisconsin greenhouse study showed that Verticillium wilt was less severe where the soil was limited. Root rot in snap beans at Hancock decreased from 60% of plants affected at pH 4.9 to 11% at pH 7.2. 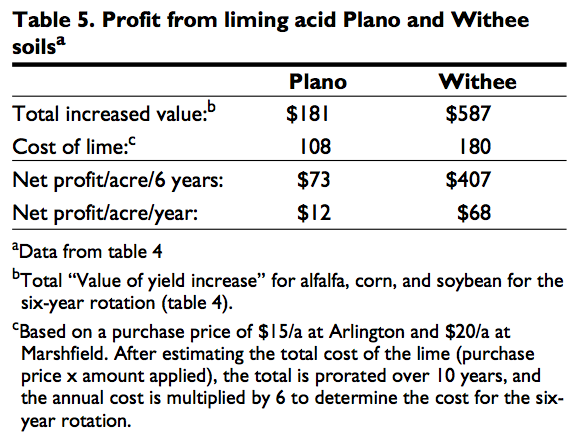 Tables 4 and 5 show that liming to a pH of 6.8 pays off in increased profits. No other practice is more cost effective – especially where alfalfa is a part of the rotation. Intensive cropping and improved management techniques result in increased crop yields – which mean greater demands on soils. To meet these demands, you must add extra aglime and nutrients. A soil test will tell you when to relime and how much to apply. For example, while high rates of nitrogen help increase corn yields, it also means you must add larger amounts of aglime. 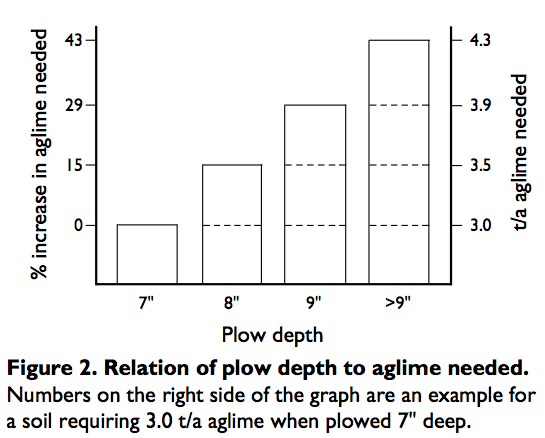 Deeper plowing also creates a need for greater amounts of aglime (figure 2). 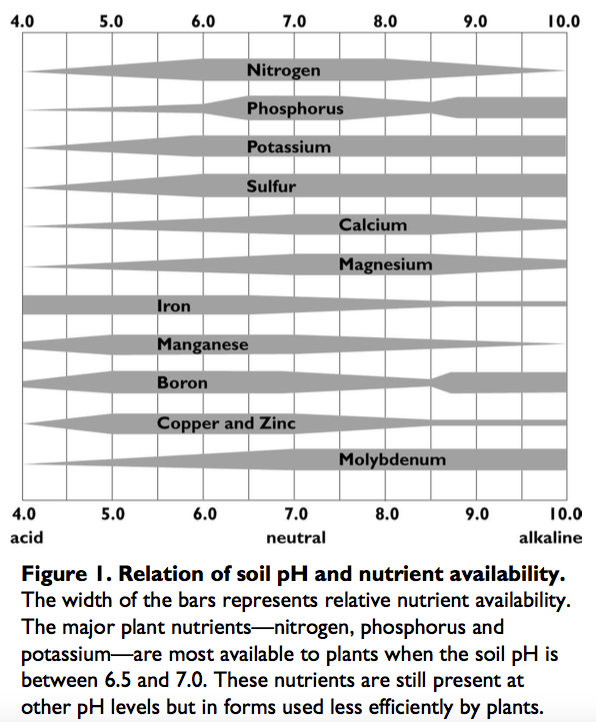 Nitrogen lowers soil pH – or makes it more acidic. 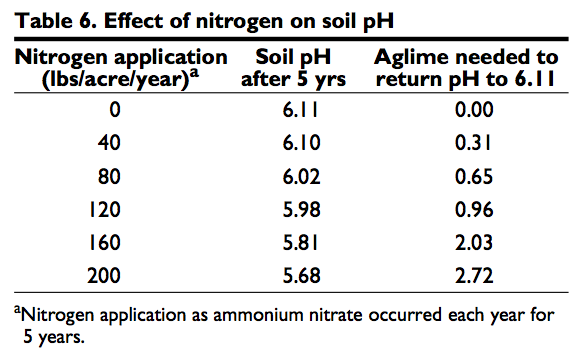 Table 6 shows the change in soil pH of a prairie silt loam soil at Arlington, Wisconsin, after nitrogen was applied for 5 years. To return the soil pH to its original level (pH 6.11) required 10.8 pounds of aglime (with a neutralizing index zone of 60-90) per pound of ammonium nitrogen added. Nitrate forms of nitrogen do not increase soil acidity because the nitrogen is already oxidized. Ammonium nitrate, for example, produces only half as much acidity as ammonium sulfate per pound of nitrogen applied, because only half of the nitrogen is in the ammonium form. If nitrogen is broadcast on the soil surface and not incorporated, as in some reduced tillage systems, an acid layer may develop at the surface. To test for this possibility, take a sample of the top 2 inches of soil, and request a lime requirement test. Be sure to tell the lab that the sample came from only the top 2 inches of the soil. If the recommended amount of aglime is incorporated before converting to a reduced tillage system, it should be possible to maintain the soil pH by periodic additions of 1 to 2 tons of top dressed aglime based on nitrogen use and soil tests. High crop yields remove large amounts of calcium and magnesium from Wisconsin soils. Aglime is needed to replace these soil nutrients, as well as those lost through leaching and soil erosion. For example, 4 tons per acre of alfalfa remove 112 pounds of calcium and 32 pounds of magnesium each year. This is the equivalent of 425 pounds of aglime per year. On the other hand, 15 tons of corn silage per acre remove 65 pounds of calcium and 30 pounds of magnesium. This is the equivalent of 275 pounds of aglime per year. It’s important to test the acidity and nutrient status of your soil at least every 3 to 4 years. Testing indicates whether your soils need aglime and how much you should apply. Check Extension publication Sampling Soils for Testing (A2100) for guidelines on sampling your soil. This publication is available from your county Extension agent. Sample should be analyzed by laboratories that give aglime recommendations for Wisconsin soils. Computerized soil test reports provide aglime recommendations to reach a soil pH between 5.2 and 6.8 depending on the crop to be grown. Once you know the soil test aglime recommendations, you should adjust these according to aglime quality. The quality of aglime is determined by how fine the aglime is ground and its chemical composition. The higher the quality of aglime, the more efficient it is in neutralizing soil acidity. You can determine the quality of aglime by its “neutralizing index zone”. This is a set of numbers that indicates its neutralizing efficiency. Neutralizing index zones usually range from 50–59 through 90–99 in Wisconsin. The higher the zone number, the higher the quality. For example, 0.7 ton of 90–99 aglime neutralizes the same amount of soil acidity as 1.0 ton of 60–69 aglime. Wisconsin ASCS-approved labs give recommendations for zone 60–69 and 80–89 aglimes. 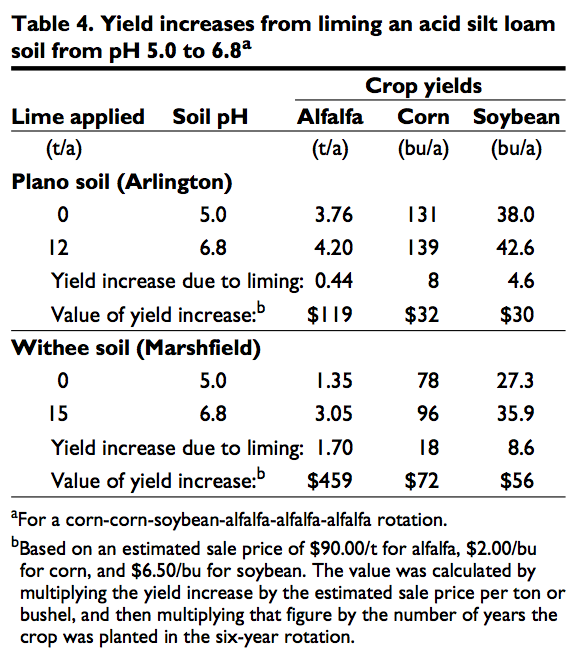 Use the aglime conversion data in table 7 if your lime vendor has a different grade of lime. Apply aglime anytime you can get equipment on the field without damaging either soils or crops. Spread aglime for the crop in the rotation that is most sensitive to acid, normally the legume. Apply the aglime at least 6 months to 1 year before the legume seeding. Thoroughly mix the aglime throughout the plow layer. The easiest way to do this is to use a digger or cultivator first, and then plow under the aglime. If you have to apply aglime in the fall or spring of a seeding year, spread it before plowing. Then, to assure a good job of mixing the aglime, the fields should be dug twice with a field cultivator, and plowed and disked before seeding the grain and legume crop. For more information, see Extension publication When and How to Apply Aglime (A2458). Authors: E.E. Schulte and K.A Kelling are professors of soil science, College of Agricultural and Life Sciences, University of Wisconsin-Madison and University of Wisconsin-Extension, Cooperative Extension. Produced by Cooperative Extension Publications, University of Wisconsin-Extension. University of Wisconsin-Extension, Cooperative Extension, in cooperation with the U.S. Department of Agricultural and Wisconsin counties, publishes this information to further the purpose of the May 8th and June 30th, 1914 Acts of Congress; and provides equal opportunities in employment and programming. This publication is available from your Wisconsin county Extension office or from Cooperative Extension Publications. To order, call toll free 877-947-7827 (WIS-PUBS) or visit cecommerce.uwex.edu.